Popular and Longest Running Show of Star Plus’ Yeh Rishta Kya Kehlata Hai is all set to Shock its Fans with some high-voltage drama in the upcoming episode. Currently, we are Seeing Professor and Student Tashan Between Kartik and Naira and In Recent Episode, we have Seen Naira and Kartik Slept Comfortably In Each- Other’s Arms. In The Latest Episode, we have Seen How Naira (Shivangi Joshi) Got Hurt and Kartik (Mohsin Khan) Took her to the hospital where He came to Know Naira’s Old Injury in Her Leg and How She didn’t allow Doctor to Look at her Injury. 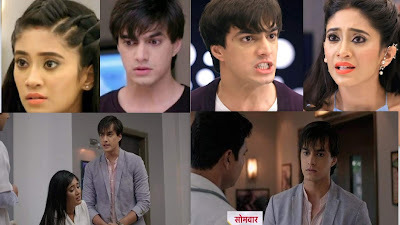 In Upcoming Episode, Kartik will come to Know Naira met with an accident also the accident occurred when Shubham (Gaurav Wadhwa) died two years ago. He Will Get Through to Core of this and Will come to Know that Doctor Advised her Not to dance More and She won’t be able to dance and has lost her biggest dream because of him and his family. He will Break down and Will curses himself for not being with her when she needed him the most. This will Lead A feeling of remorse engulfs to him and he thinks about committing suicide. He will Feel Not Worthy for Naira’s Forgiveness. What will Naira do When She will come To Know About this ? Will She Able to Save Him and Forgive Him?